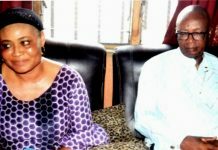 The Nigeria Union of Journalists (NUJ), The Tide Chapel, has organised a sendforth party for three of its members who retired recently. 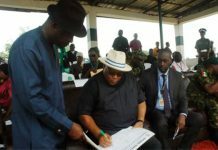 Among those sent forth were Mr Sam Ovu Eleonu, Shedie Okpara and the Late Soye Wilson Jamabo. Meanwhile, the General Manager of the Rivers State Newspaper Corporation, Mr. Vincent Ake, has urged staff of the corporation to be more dedicated and committed to duty. Mr Ake, who gave the charge during the sendforth ceremony stressed the need for journalists in the corporation to brace up for the task of ensuring that The Tide made more impact across the state and the entire country. He described journalism as a noble profession, but added that the concept depends on the practitioners. The General Manager also charged them to be decent and neat while covering events. Speaking on the three retirees, the Ag. Editor, Amieyeofori Ibim , the Group News Editor, Nelson Chukwudi and the Business Editor, Boye Salau said that the three retirees had contributed so much towards the development of the corporation. For Mr Amieyeofori Ibim, Jamabo’s commitment was a driving force for many journalists, Nelson Chukwudi on his part, described Mr Ovu Eleonu as a forthright person while for Boye Salau, Shedie Okpara was among those whose contributions have made The Tide what it is. Earlier, the Chairman of the Nigerian Union of journalists (NUJ), The Tide Chapel, Mr Akujobi Amadi, described them as active participants in the union while in active service.